Confrontation is an RPG / tactical strategy hybrid from French developer Cyanide Studios, which is also set to release the RPG Game of Thrones in the upcoming weeks. 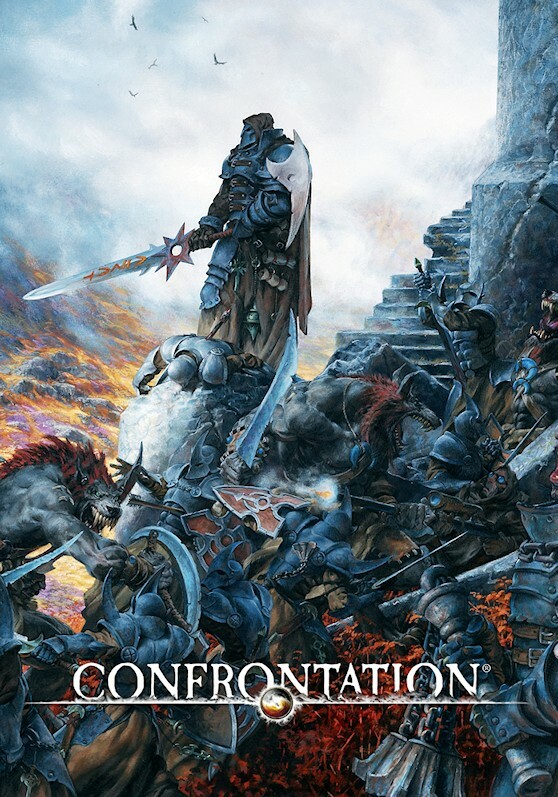 Confrontation is based on a miniatures and dice war game, where small groups of soldiers battle each other. I've never played the war game (I'd never even heard of it until recently; apparently it's more popular in Europe), but I'll try to give you an idea if the computer version of the game is worth your time and money. Confrontation takes place in the land of Aarklash, where factions of people seem to be perpetually at war. As the game opens up, you take control of four Griffin soldiers, and you learn that the Scorpion faction has figured out how to clone a giant war beast called the Mecasyatis. You then spend the rest of the campaign trying to thwart the Scorpion threat, and this effort takes you through the lands of the Jackal and the Wolfen, the other two factions in the game, which means you get to fight everybody. As you play through the campaign, you eventually unlock a dozen soldiers for the Griffin faction. These soldiers get a variety of skills to damage and debuff their enemies, and heal and buff their allies, and they generally fall into four classes: tank, healer, dps, and crowd control. During each mission, you get to work with four of these soldiers, and some of the fun in the game is trying out different combinations to see how they work together. Each time you kill an enemy or reach a sanctuary during a mission, your soldiers earn experience (the soldiers you're not controlling also earn some experience, just not as much). Then when your soldiers gain levels, they earn points to spend on their attributes, including strength, constitution, agility, vivacity (think dexterity), intelligence and wisdom. All of the attributes are useful to all of the soldiers -- for example, intelligence makes damaging skills work better, but it also improves defense against damaging skills -- and since attributes get more expensive the more your upgrade them, Confrontation isn't really a min/max game. You're better off taking a more moderate approach. Every other level, your soldiers also get a point to spend on their skills. Each soldier gets five or six skills, and each skill has five ranks. As an example, one of the soldiers in the game is named Darius. He's the leader of your band of soldiers (as far as the story is concerned), and he's a tank. He gets six skills: Avenging Arm (to damage enemies), Divine Command (to dispel "control" debuffs), Divine Protection (to increase the physical armor of nearby allies), Exaltation of Soldiers (to increase the hit chance of nearby allies), Frontal Assault (to charge at and provoke enemies), and Holy Prayer (for self-healing). Since Darius is a tank, each of his skills costs 50 stamina out of 100 stamina total, which means you can't just spam his skills during a battle. You have to pick just the right moment to use them. The best part of Confrontation is the battle engine. The game is good at creating opposing groups of enemies to challenge your party, and you have to pay attention to who you're fighting so you can eliminate the most potent threat first. Most of the challenge in the game comes from avoiding debuffs. Things like provoking, charming, silencing, fearing, and immobilizing prevent your soldiers from using their skills, which is where most of their power comes from, and so if you just attack enemies randomly, or allow your soldiers to pick their targets, then you're going to get into trouble. You always have to knock out the annoying spellcasters in the back first (such as the Neuromancer for the Scorpion faction), or your entire party might get disabled and slaughtered, no matter how powerful it is.